Dumitru Trihenea was born to Dumitru and Maria in Tilişca Sibiului, Romania, on 8/6/1909. His parents were shepherds. In 1915, his parents moved, with their flocks, to the Crimea, while Dumitru remained with his very devout grandmother. In 1922, he had a dream in which Our Most Holy Lady gave him a tour of the monasteries on the Holy Mountain. In the same year, despite the many reservation of people who thought he was too young, he decided to go to Mount Athos, the Bower of Our Lady, where the Mother of God herself walked and which she holds under her protection. With him were the hierodeacon Gherontie and hieromonk Diomid. They took a boat from Constanţa, arrived in Thessaloniki and then left for the Kelli of Saint Ypatios, which belongs to the Monastery of Vatopaidi. The Elder there was the strict and austere monk, Teodosie, who had a blessed brotherhood of five monks. The kindly hieromonk Gherasim, from the Kelli, taught them music and the Athonite way of doing things. The Elder insisted on the importance of cutting off one’s own will, as a sure and swift way of acquiring the necessary and great virtue of humility. In 1929, with many tears to the Mother of God and heartfelt thanks and praise to our All-Good God, Dumitru was tonsured a monk [and given the name Dometie]. 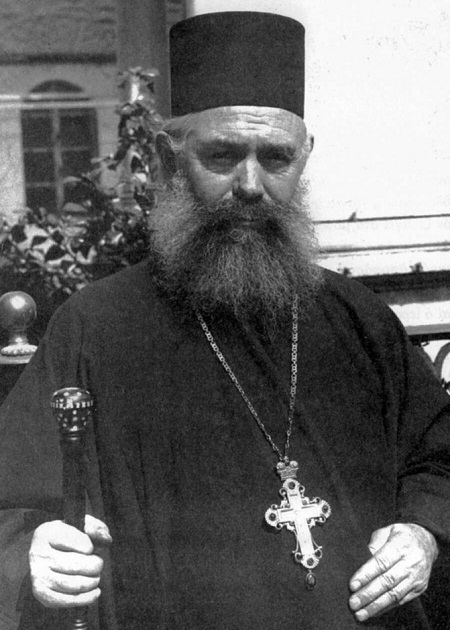 In 1937, he was ordained deacon and priest by the retired Metropolitan Ierotheos of Militoupoleos (†1956). In 1964, he assumed the duties of the Elder of their Kelli. On 8/2/1965, he undertook the duties of Abbot at the Holy Monastery of Saint George Zografou, and was enthroned by the Holy Community of the Holy Mountain. He was the first Romanian Abbot in the recent history of the Holy Mountain. He found the monastery in a state of disarray, in poor repair and with very few monks. In the decade he lived there, he attempted patiently and persistently to achieve a measure of organization, to increase the small number of Bulgarian monks he found there, to embellish the main church, to bring order to the Rule and to make a start on renovating the buildings. Thereafter he returned to the Kelli of Saint Ypatios. He was a discerning, simple and humble confessor. He was also the Spiritual Father for the monks of the Monastery of Konstamonitou. Many monks and laymen- Greeks, Romanians and Bulgarians- passed under his stole. He was a man of love and patience. As far as he could, he tried in all ways to help others who were afflicted with various temptations. He made his own blends of herbal treatments for a variety of illnesses, many of which were successful. No doubt the prayers and supplications he made also contributed. In order to hide his virtue, he said that it was the herbs that made people well. In his spartan cell, among the many icons he had, one of Our Lady stood out. It gave off a wonderful fragrance and he held it in particular reverence, kissing it often. It was a modern icon, from the 19th century, with a silver-plated sleeve, and from an artistic point of view was nothing special at all. Hieromonk Dometie said to a visitor of his: ‘We should live the life of Christ and love and study the Gospel. Above all we should love Christ, Who is the One true teacher. The faithful should keep the divine commandments, have proper confession, take communion frequently with tears and strong hope in the mercy of our All-Powerful and All-Good God…’. The former Abbot of Zografou, who loved the Mother of God so much, went to his rest in the Lord on the feast of her Entry into the Temple, 21/11/1985. Sources-Bibliography: Archimandrite Ioanichie Balan, Archimandrite Dometian Trihenea, The Orthodox Word 206/2001, pp. 26-38. Source: Monk Moïsis the Athonite, Μέγα Γεροντικό εναρέτων αγιορειτών του εικοστού αιώνος, vol. II – 1956-1983, Mygdonia, 1st ed. September 2011.